Material purchase orders can be created to order raw materials from your suppliers. Stitchex will help you build an order for your supplier with the quantities necessary to cover your sales and production. 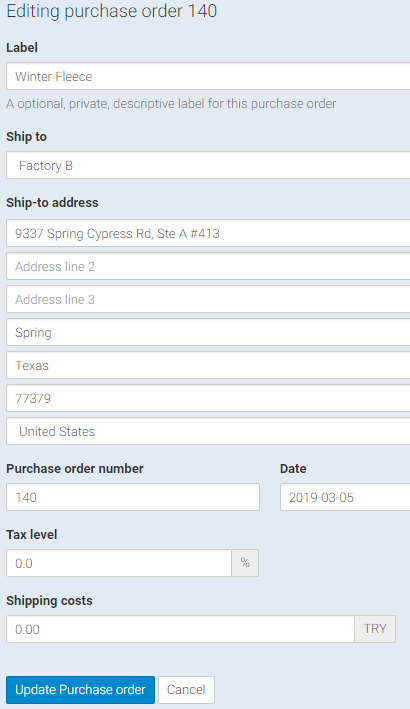 If you add sales later, Stitchex can let you build an order for the additional materials or increase quantities in an existing tentative order. Each purchase order is linked to a particular supplier. You'll need to enter your supplier's details on the Companies page and associated your raw materials with that supplier before building your purchase order. Click on Purchase Order from the left, main vertical menu. 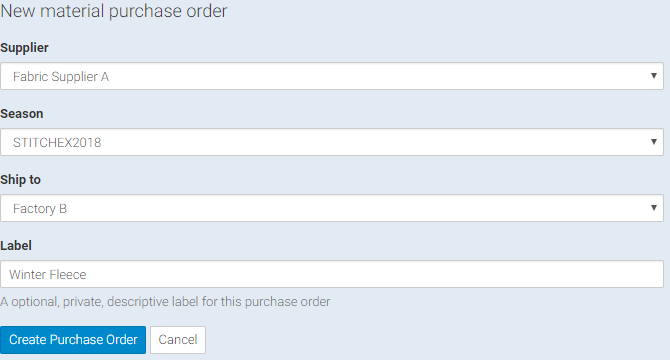 Click the plus sign in the top right corner of the screen to create a new Purchase Order. Your raw materials are associated with the supplier (check that by updating the raw materials database). You have set up the raw material composition of your products. You have confirmed your sales orders. You haven't already created (and populated) a material purchase order for this supplier. (Note: A size field has recently been added to the Purchase Order and is not shown on the picture above). Provided that the material is associated with the supplier, you can add any material (regardless of its requirement status) to the order by searching by name or reference with the search box in the suggestions area. Note that the suggestions area shows only materials needed to satisfy Confirmed Customer Sales. You can use the down arrow if you want to also show those materials on Production Orders. Be sure to click the "Refresh" button on the top right if you change this view. Feel free to modify the quantity field. You may want to order more than what was required to fill customer sales orders. Once all of your materials have been added, click the SAVE button. If you need to make changes to the label, ship to location, shipping cost or tax information, click the pencil in the top right of the purchase order. When you have finished building your purchase order, click "Confirm Order" button in the top right of the page. Otherwise, your Purchase Order will remain in Draft mode. Later, if you decide you do not want it to be a confirmed order, you can click the "Revert to Draft" button. In addition, once you receive all of your products from your supplier, you can mark the Purchase Order as "Complete". In the top right corner of the screen, use the "Check In" button to indicate whether the materials have been received. If you make an error, you can use the "Reverse" button as well to back out the "check in". When you "Check In" a material, you are indicating that it has been received and it will reduce your "on ordered" quantity and add it to your "in stock" quantity. Using an example of "12 Soft Cotton" materials on a confirmed Purchase Oder, watch what happens to our "Before Check In" and "After Check In" quantities in our Material Inventory. The quantity is showing 12 are "Ordered". In stock is 57,202. After Check In, the quantity "Ordered" is set to zero and the "In Stock" has increased by 12 and is now 57,214.